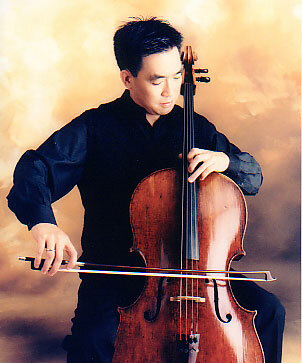 Cellist David Ying is well known to concert audiences as the cellist of the Grammy Award winning Ying Quartet. With the Quartet he has performed worldwide in celebrated music venues from Carnegie Hall to the Sydney Opera House. The quartet is also known for its enterprising view of concert performance, which has led to visits to the White House as well as correctional facilities, and to business schools as well as hospitals. In its collaborations, the quartet has performed with chamber music greats Menachem Pressler, Gilbert Kalish, and Paul Katz, as well as explored new musical territory with folk musician Mike Seeger, the Turtle Island Quartet, and even actors, dancers, chefs and magicians. With the Quartet, David has created a wide range of recordings that have received consistent acclaim, as well as a Grammy Award and four Grammy nominations. Their recorded work ranges from traditional- Tchaikovsky’s three string quartets and his Souvenir de Florence- to contemporary- three albums of their LifeMusic commissions. It also includes unique collaborations with the Turtle Island Quartet, pianist Billy Childs, and Phish frontman Trey Anastasio. In October 2011, the quartet released the two string quartets and piano quintet of Anton Arensky (Sono Luminus). David first pursued chamber music avidly as a teenaged student at the Eastman School of Music with his piano trio, which was awarded first prize at the Coleman Chamber Music Competition. Later he would also win the Naumburg Chamber Music Award, this time with the Ying Quartet. David is also highly regarded as an individual artist, having been awarded prizes in the Naumburg Cello Competition and in the Washington International Competition. As a solo cellist, he often performs with his wife, pianist Elinor Freer. Together they are also artistic directors of the Skaneateles Festival. Their imaginative view of music has helped to earn the festival a devoted following and national recognition, including a special ASCAP award for adventurous programming. David presently serves on the cello and chamber music faculty at the Eastman School of Music in Rochester NY, where he and Elinor reside with their two children.